Home › Camera & Photo Accessories › Camera Video Bags › Andoer ..
price / quality camera backpack and delivery 9 days/Belgium = entire satisfaction. Amazingly fast delivery to Northern Thailand. very nice product and super value. This camera bag is lightweight and high capacity. It is thick padded and water-resistant nylon material, back-open design, wide thick shoulder straps and exquisite workmanship that make it excellent and exquisite. Lightweight and high capacity, can hold two cameras, two lens, one pad and other accessories. The detachable dividers allows you to divide the bag according to your needs. Padded anti-shock material, ensure your camera and lens away from scratches and collision. Back open design, protect your camera from stealing. Water-resistant nylon, effectively prevent the drizzle. Wide thick shoulder straps with mesh design, lighten the loads and more ventilative. Special design, you can carry a tripod with the backpack. With the portable handle, more convenient. 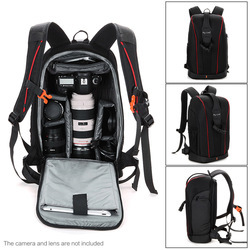 Only the backpack is included, the lens and other accessories are not included.